Red-bellied woodpeckers nested in a tree so rotten that it was ready to break in the next big storm. In the lovely, warm, late April afternoon, Michael and I walked into a woods near where we live. Little tender leaves were showing against brown branches. Violets were under foot, along with the fuzzy white heads of pussytoes, my favorite early spring flower. We picked our way, clambering uphill through tangled second-growth woods. And then at the top of a knoll, suddenly the walking was easy, the floor of the forest open. We had entered a stand of ancient oaks, somehow spared when the original forest fell to the saw a hundred years ago. Oaks hundreds of years old have a different shape from ordinary, more recent, trees. Their lower limbs run horizontal and stretch far from the trunk, and their large canopies are rounded. While the tops of the oaks keep growing, the lower branches, deprived of direct sunlight, languish, return limb by limb to the forest floor, and dissolve into humus. Close to the path was a tall snag, a tree that had been killed by disease or lightning. All its branches were gone, and most of the bark had sloughed from the still-standing trunk. While Michael and I stood there talking about the nutrient cycles of the forest, a male Red-bellied Woodpecker landed on the snag near the top and called a strident "Chirrah! Chirrah!" The male lit below her for a moment and then entered the hole, while the female flew into the woods. We knew what this meant. They had eggs! Michael and I sat down and watched. The birds took turns inside, never leaving the nest unattended for more than a minute. As for our intrusion, after taking one long look at us, the birds seemed to ignore us. We were delighted. For the next month, we went to the oak grove nearly every day. A week into May, the violets and pussytoes were gone, but spring beauties had taken their places. 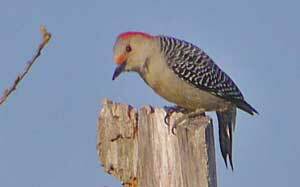 We saw the mother Red-bellied Woodpecker go into the snag with her bill full of tiny reddish berries. So the eggs had hatched. We were as pleased as if the event had been to our own credit. On our next visit, we heard the faint crying of baby woodpeckers inside the dead trunk. From a treetop, the male uttered his bringing-food call, and then in a swoop he landed on the snag. Through our binoculars we saw a spider's brown, angular abdomen protruding from one side of his bill, while its long legs kicked futilely from the other. We surmised the spider was one that stalked the bark of the oaks or the fallen leaves on the forest floor. To satisfy its hunger, it captured and remorselessly slew centipedes, and moths still cradled in their cocoons, and countless insects. 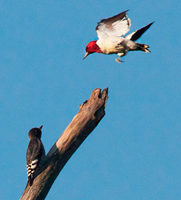 I'm sure the spider ran for its life when it felt the woodpecker's sudden shadow, but to no avail. Without hesitation, the bird seized the spider in its bill. Into the hole the unwilling spider was dragged, to be thrust into the open beak of a baby woodpecker and swallowed whole. Day after day, both parents shuttled in and out of the nest, carrying the harvest of the grove. It was a wonder that they did not run out of prey, but of course the forest constantly made more. As spring progressed, wild honeysuckles bloomed in billows and bowers along the paths, and hummingbirds hovered to probe the nectar-bearing blossoms. The dead oak chirped lustily as the baby birds inside awaited meals that came as regularly as the ticking of a clock. But May is fickle. A storm blew in from the north, bringing cold, heavy rain and violent winds. In town the yards were strewn with branches, streets became rivers, and power lines sparked on the ground. In such weather, I wondered, how could the woodpeckers find food for their young? When the storm passed, Michael and I returned to the oak grove. 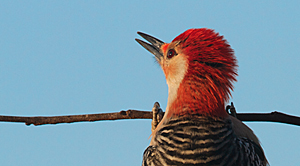 We hardly recognized the woodpeckers' snag, for it looked raw, unfamiliar. The top had broken off at the height of the nest and smashed in pieces across our path. We feared the nest might be now open to the sky, but it was too high for us to see. We heard no sound from within. We heard the male woodpecker calling a strange, distraught note, unlike his feeding call. We did not know whether the baby birds were still inside, or whether they were alive, and we could think of nothing that could help them. A ladder's weight would probably topple what remained of the snag. My own words come back to me, words I'd spoken many times to strangers on the phone, "Of course you feel bad about the failure of a nest," I'd told them, "but you have to realize that most eggs do not result in baby birds that fly away." Sometimes I'd added, cruelly, it now seemed to me, "Baby birds are part of the food chain, and the chain extends in both directions." Crows, well-known devourers of baby birds, cawed in the woods. Everything in the oak grove yearns to live. Over the years, a tree reaches upward for the light, seeking to outgrow the shade of its neighbors. A spider does not write poems on the subject of life and death, but it runs with all its heart when something threatens it. And my heart, my human heart, longs to see the baby birds survive. Nature is not human hearted, observed the Chinese sage Lao Tzu. Despite all desire and exertion, the spider is carried off by the woodpecker, the oak succumbs to disease and storm, and yes, most baby birds are eaten before they make their first flight. Scant consolation to the spider, that it nourishes the bird. But the grove--the grove embraces spider, tree and bird, and storm and human heart, like the wholeness that encompasses all change. Reluctantly, we turned to go home. Michael made a parting glance over his shoulder and then said matter-of-factly, "There's a baby woodpecker looking out of the hole." A young bird put its head out of the hole in the snag, looked left and right, and chirped. It pulled one wing free of the hole. I thought it was going to fly out of the nest before our eyes, but instead it sank back out of sight. A moment later the mother arrived with something in her beak and dived into the nest. Michael and I walked home together through the forest. The air was fresh after the storm, and sweet williams carpeted the floor of the oak grove with blue and lavender blossoms. Story first appeared in The Iowa Source. Heaven and earth are not human hearted. They see all things must pass away. The wise man is not human hearted. He sees all men must pass away. Oh heaven and earth how like a bellows! Always emptying yet full each day. But words mean less the more we say. Better heart stay centered in the Way.